J Richard Middleton has a piece on his publisher’s blog expanding an idea that was implicit, though not stressed, in his book A New Heaven and a New Earth, which I briefly reviewed here. In brief, his study of the Scriptural material shows that heaven, the dwelling place of God, is presented as part of the created order (that is, the same “heavens” that shine down on us day and night), rather than as an uncreated realm beyond creation. The Bible-reading part of me says, “Well, of course,” because that’s absolutely the way it does talk of it. But it’s one of those areas (and there are many, such as the idea of the fallen natural creation) where our thinking is often unconsciously controlled by received assumptions and rational interpolations, and so I find I have in the past usually translated talk of “heaven” into a dichotomised concept of “space” (vast, alien, largely empty or, perhaps, containing extraterrestrial civilizations) versus “heaven”, the uncreated and dimensionless realm of the uncreated God, beyond space and time. It’s a modern equivalent of those mediaeval geocentric schemes in which the various supra-mundane spheres ended in the universe’s boundary, beyond which God and his retinue are (pictorially) seated in eternity. In Scripture there is no such distinction, though that does not end the discussion. What Scripture does by this identification of the heavens as God’s created dwelling is to build a strong picture not only of God’s transcendence, but of his immanence. The Genesis 1 creation story, then, has to be seen very much in terms of God’s creating the universe and then condescending to dwell within it, intimately involved with its structures and functions. This is in marked contrast to the deistic tendency in all its forms, in which an aloof and completely transcendent Deity has few, if any, points of contact with our existence. 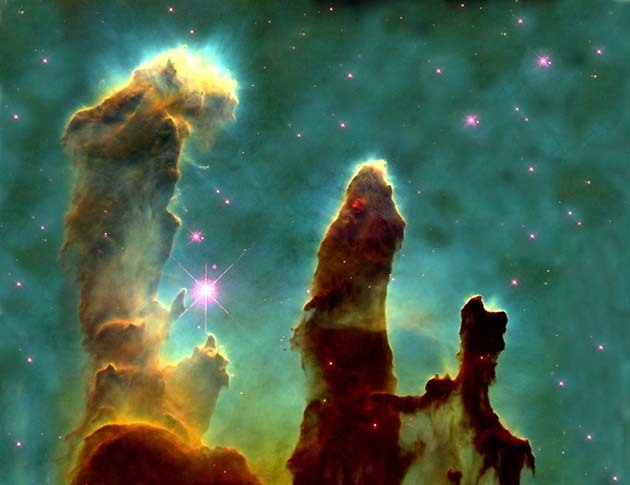 At the same time, the Bible’s cosmic temple imagery, echoing the physical separation of the earthly realm from the heavens in its theology of God, by making God’s heaven the “holy of holies”, maintains a due sense of his otherness and transcendence: “God is in heaven and you are on earth, so let your words be few” (Ecclesiastes 5.2). 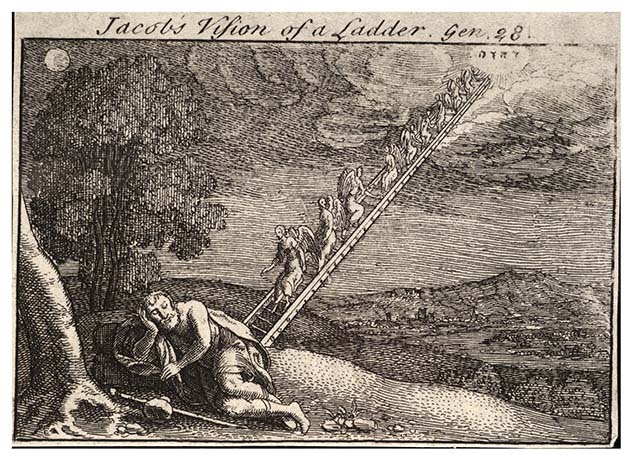 His immanence is pictured (in part) in terms of his coming down (as at the tower of Babel), of stooping to help the widow and orphan, of having the earth as his footstool; and in the New Testament in Jesus’s describing himself in the language of Jacob’s ladder, in his ascension, and in the prophetically allusive nature of the tearing of the temple curtain (“Oh, that you would rend the heavens and come down, that the mountains would tremble before you!” Isa 64.2). Now, such a mindset, actually inherent in the first creation account, actually casts a lot of light on the whole thrust of God’s intentions for the world. I had reservations about Middleton’s earlier suggestion that the Genesis 1-2 account makes no mention of God’s coming to dwell in his temple, his image in the form of mankind being his representative instead. But, at least as far as the earthly realm is concerned, heaven as God’s created dwelling place implies some such thing. In Israel’s earthly tabernacle and temple, the glory of God dwells in the holy of holies, where no man may go except the High Priest on one day a year – though God may still be encountered both by the priests serving in the temple, and the people worshipping in its courtyard – his shekinah characteristically spills out everywhere when he comes in power. But the “direction of travel” of the Bible is the eventual dissolving of the barriers between heaven and earth, God’s dwelling and man’s dwelling, so that in Revelation “the dwelling place of God is with men”, and there is a “new heaven and a new earth, the home [singular] of righteousness.” In my view (and that of many from Patristic times onward), that was an historical process that was always intended as the goal of creation, but that was interrupted by the Fall. Eden was a microcosm of divine-human intimacy, which apart from sin had been intended to spread through the world – we would have seen, in some sense, that veil (firmament) of separation dissolved through Adam. Now we begin to see it achieved through Christ, in whose image Adam was made and who is the true image of God. There are, it seems to me, preferences to be made (if not cast-iron conclusions to be drawn) in ones natural theology from this picture. Here we have a God who has been indwelling his cosmos since creation, and I, for one, would expect to see his influence on it as much as I would expect to experience, as a worshipping Jew, his effectual presence in the Temple, or in the liufe of a believer with the Holy Spirit. At the same time, the fact that earth is a place that he influences (as it were) from his heavenly dwelling means that it has a separate existence from him (in other words, that its secondary causes are real, and not simply projections as in strict occasionalism). Like the physical heavenly bodies – such as the sun and the moon – God is essential to every earthly event, and yet leaves the world its own being. In fact, the same is actually even true of the heavens themselves, for if Genesis tells us anything, it is that God is never a part of his creation, but that it is all subject to him in a creaturely way. And so the biblical picture is of creation as his temple, not as his body. It’s also important to show how the Bible retains this ultimate transcendence of God – the fact that he “dwells in heaven” is an act of fellowship and condescension, not paralleled by the pagan gods who arise within the creation, and simply order it for their convenience, including temples to live in and people to feed them. The creation account of Genesis begins that theme by the total dependence of everything on God for its existence as well as for its function. But King Solomon (I’m sure not uniquely) was fully aware of this when dedicating his temple: “But will God really dwell on earth? The heavens, even the highest heavens, cannot contain you. 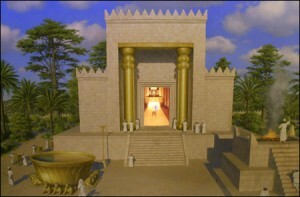 How much less this temple that I have built” (1 Kings 8.27). Solomon, then, sees the dwelling of God in the temple – which was “real” enough for God’s glory to have prevented the priests working (1 Kings 8.10-11) – as being more subtle than a physical fact; the temple was more like a psychological locus towards which Israel could direct their prayers. But he also had the insight to see that even the dwelling of God in heaven is of the same character – if it had been his “native” dwelling, it would have been big enough for him. Psalm 139, too, balances the idea of God’s inhabiting the (created) heaven by “literal” talk of his omnipresence. And so we have a view in which God’s transcendence and his immanence are in perfect balance. Because of this Richard Middleton describes this concept of heaven as God’s dwelling as “symbolic”. Whilst I know what he means, I’d quibble with that word, because it is too weak. So often in the Bible, signs are actually what they represent. God’s glory did fill the temple, even though it couldn’t “literally” be his house. The elders of Israel did meet with, and see God, in his heavenly dwelling, with the blue firmament as his pavement (Exodus 24), even though “no man has seen God at any time”. (And incidentally, note that they got through that raqia without a trapdoor, and weren’t drowned by the waters above it, suggesting again that modern views of Hebrew cosmology are over-physical). The body of Christ is encountered in bread and wine even though (contra the transubstantiationists) they remain bread and wine and his risen body is at God’s right hand in heaven. Similarly the word of God does not represent reality – it creates it. Once again, we find that modern concepts, that are intrinsically materialist, can’t really do justice to the richness of biblical ideas, and to see the concept of heaven as a “symbol” is to look for some different reality beyond it, whereas I suggest the “symbol” is the reality, at least as far as our limited understanding goes. Perhaps we can no more get beyond the symbol to what is “really” meant (as opposed to living our lives in the light of its theological insights) than we can get beyond the idea of elementary particles and/or waves in physics: it may not be “the truth, the whole truth and nothing but the truth,” but it’s what we need to know to avoid just being wrong. That is, I think the ‘concurrence’ is not just for events, but to sustain the being of everything. I see this continual giving as one aspect of the ‘daily bread’ we receive. Quite right Ian – bad phraseology on my part. I had in mind “being” in the sense of “way of doing business” rather than “independent existence”, but of course concurrence is in agreement with all but the most extreme forms of Deism in affirming God’s continual sustenance of creation. I have always taken the view that wherever God is, there is heaven as sacred space. The Temple and all associated structures and activities are designed to teach Israel (and now the Church) to understand the distinction between the Holy, Sacred, and that which is “outside” such sacred place, wherever that may be (including an “outside” of time and space, a concept that is impossible for a human being to understand). That’s a sensible perspective, especially in understanding some of the imagery of the coming together of heaven and earth through the union of God and man (most graphically in Revelation, of course). The biblical imagery, as I think Middleton’s suggestion illustrates, is somewhat more nuanced than that, in that God, being immeasurable (or “immense” as the older theological word has it) is “really” everywhere and nowhere particular. So there’s an element (as I think you suggest) of “representation” in God’s dealings. In one sense the temple is holy because he is especially present there, whereas in another he represents his presence there (in the shekinah, for example) because he has designated it as holy. And as you say, that is to give us to understand the distinction between the holy and the non-holy. In the end, those distinctions seem to represent our communion and fellowship with God, or the lack thereof. Being excluded from Eden happened as man was excluded from God’s presence, not because Eden was sacred, but because God was. Similarly (as my one-time Australian pastor used to say) all the holiness teaching in Leviticus was primarily intended to remind Israel they were not holy. On that understanding the heavens remain, even now, a fitting symbol of “unapproachable light”. Incidentally, it’s mildly interesting that Yuri Gargarin’s purported statement that he didn’t see God up in space was actually made by an earthbound Kruschev – Gagarin himself was, it seems, a member of the Russian Orthodox Church.